These are winter spawning, rope cultured black mussels that are raised from hatchery-produced seed in southern Puget Sound’s Totten Inlet. The ropes are suspended from either rafts or longlines in about sixty feet of water, so the mussels themselves never touch the bottom and are free of sand, mud, or grit. They grow very quickly hanging in the most nutrient rich part of the water column and reach market size in less than a year. 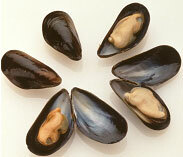 They tend to be larger than most other mussels in the marketplace and are renowned for their plump, sweet meats.